Almost 2.2 billion people claim Christianity as their religion, but surveys show fewer than half attend church regularly. What does God say about fellowship? A Gallup report issued in 2010 showed 43 percent of Americans attended church on a weekly basis. In the United Kingdom, a 2007 Tearfund survey showed only 10 percent of the adult population attended church on a weekly basis. 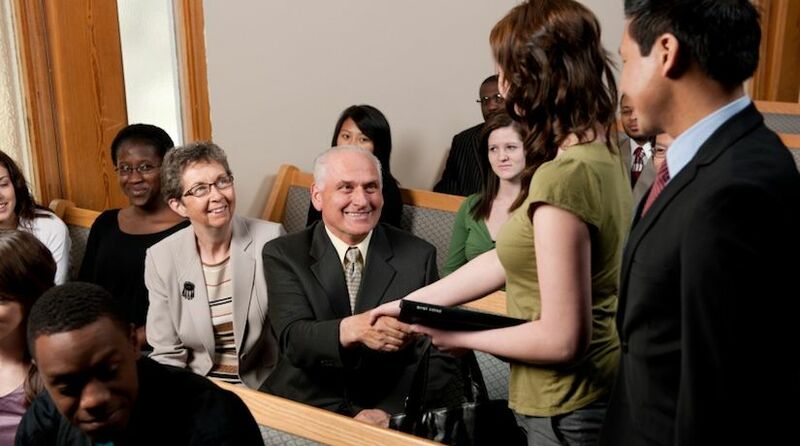 In Canada, a Pew Research report found that 27 percent of adult Canadians attended church at least once a month in 2010. All of these numbers were higher in times past, and it’s clear Western society today puts a much lower priority on church attendance than it once did. Whatever the trends, the most important factor for Christians to consider is what God says. As we will see, the Bible reveals that God originally instructed His people to fellowship together regularly on His Sabbaths. Why does God want His people to fellowship together? There are real benefits that come from Christian fellowship. Accounts from the earliest days of the Christian Church show people gathering together for worship. Soon after the crucifixion of Christ, His followers were gathered together on the Day of Pentecost: “When the Day of Pentecost had fully come, they were all with one accord in one place” (Acts 2:1). Notice they were not only gathered together, they were also of the same mind (“one accord”). Other accounts from the days of Paul’s ministry show the practice of gathering together on the Sabbath day. For example, Luke records this about Paul’s visit to Philippi: “And on the Sabbath day we went out of the city to the riverside, where prayer was customarily made; and we sat down and spoke to the women who met there” (Acts 16:13). The word “convocation” in Hebrew (miqra) means “convocation, sacred assembly … for religious gathering on Sabbath and certain sacred days, Exodus 12:16” (Brown-Driver-Briggs Hebrew and English Lexicon). Implicit in the meaning of “convocation” is the gathering together and fellowshipping of God’s people on His Sabbaths and holy days. Christian fellowship and holy convocations go hand in hand. It is also important that those who gather together are truly students (followers) of Jesus Christ and of His example. For more information on this topic, please see the post titled “Mainstream Christianity and the Bible: Do They Add Up?” on this website. Probably the most famous words about Christian fellowship are in the book of Hebrews. Christians are commanded “to stir up love and good works, not forsaking the assembling of ourselves together” (Hebrews 10:24-25). In order to better understand the value of fellowship, it is worth taking a look in more depth at the issues addressed in the context of this statement. Hebrews chapter 10 begins by talking about the sacrifice of Jesus Christ and how His sacrifice made possible the forgiveness of sin. Animal sacrifice, offered by the priests of Israel, couldn’t truly forgive sin and give us reconciliation to God. In view of that sacrifice, we are told in verses 19-22 that we have a new High Priest and, because of Him, we can enter “the Holiest” (before the presence of God) with our sins washed clean. The author of Hebrews then goes on to address our collective duty as Christians, and how we (together) should conduct ourselves and how being together will bring about benefits. “Let us hold fast the confession of our hope without wavering, for He who promised is faithful” (Hebrews 10:23). Christians are urged to hold fast “without wavering” to the message and the hope brought by Jesus Christ. In the context, we see this is a task best accomplished by working together! In the book of Ephesians, the apostle Paul talks at some length about the role of the ministry and of other believers in finishing this work begun in Christians by Jesus Christ: “And He Himself gave some to be apostles, some prophets, some evangelists, and some pastors and teachers, for the equipping of the saints for the work of ministry, for the edifying of the body of Christ … that we should no longer be children, tossed to and fro and carried about with every wind of doctrine, by the trickery of men, in the cunning craftiness of deceitful plotting” (Ephesians 4:11-14). “From whom the whole body, joined and knit together by what every joint supplies, according to the effective working by which every part does its share, causes growth of the body for the edifying of itself in love” (Ephesians 4:16). These benefits described in Ephesians are to be derived from fellow believers—Christians “joined and knit together” in fellowship! The group, working together, can be protected from wandering away from biblical truth and can grow together spiritually. Hebrews 10 next describes what the nature of that fellowship should be. Not surprisingly, the nature of our interaction with one another plays an integral part in making fellowship valuable. “And let us consider one another in order to stir up love and good works” (Hebrews 10:24). The mere act of assembling together at the same time and place will not, by itself, produce positive results. Positive, uplifting interaction drives spiritual benefits! The apostle Paul urged the Church members at Corinth to be unified and to consider each other as fellow members of one unified body. The apostle Paul urged the Church members at Corinth to be unified and to consider each other as fellow members of one unified body: “That there should be no schism in the body, but that the members should have the same care for one another. And if one member suffers, all the members suffer with it; or if one member is honored, all the members rejoice with it. Now you are the body of Christ, and members individually” (1 Corinthians 12:25-27). Paul listed them first as the collective Body of Christ, and second as the individual members making up that Body. Christian fellowship should produce cohesiveness and mutual support such as this. There is an example from the same letter to the Corinthians that shows what not to do when assembling together: “Now in giving these instructions I do not praise you, since you come together not for the better but for the worse. For first of all, when you come together as a church, I hear that there are divisions among you, and in part I believe it” (1 Corinthians 11:17-18). The simple act of congregating together doesn’t achieve the goal of Christian fellowship. How Christians treat each other when meeting together is crucial. Following the path laid out for us by Christ should set the tone for how we treat one another: “But if we walk in the light as He is in the light, we have fellowship with one another, and the blood of Jesus Christ His Son cleanses us from all sin” (1 John 1:7). The phrase “gather together” is translated from the Greek word episunago. And, in fact, when the author of Hebrews uses the word episunagogue in Hebrews 10:25, he admonishes Christians to continue to assemble together, always being mindful that the return of Christ (“the Day”) is approaching! Jamieson, Fausset and Brown’s Commentary on the Whole Bible has the following observation on the use of the Greek word episunagogue in Hebrews 10:25: “The assembling or gathering of ourselves for Christian communion in private and public, is an earnest of our being gathered together to Him at His appearing” (revised edition, p. 1429). This makes quite a compelling reason to assemble in Christian fellowship! In the next verse, David compares this unity to the special anointing oil used by the high priest in the tabernacle of Israel. In the Old Testament, oil was used in the anointing of priests and kings (1 Samuel 10:1). In the New Testament, anointing with oil became a symbol of the Holy Spirit and the mind of God (Acts 10:38; 1 Corinthians 1:21-22). Unity is also compared to the “dew of Hermon” (Psalm 133:3). Mount Hermon is a high peak between the border of Israel and Lebanon. It is a significant source of water for the area. Some of the water is provided through snowmelt, but daily morning dew is the best source of water from late spring until fall. Water is another symbol of the Holy Spirit (John 7:37-39). For more information, see “Holy Spirit: What Is the Holy Spirit?” and “What Is Baptism?” on this website.